The District of Columbia Office Of Human Rights requires all District of Columbia businesses with employees to prominently post a number of labor law posters, covering topics such as the minimum wage, health & safety, and other important labor laws, in the workplace. 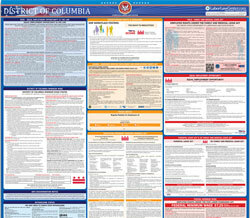 You can download or print all of District of Columbia's mandatory and optional labor law posters on this page, free of charge. Posters can be printed out at your convenience. Some of the posters must be acquired through the Office of Wage and Hour, Office of Unemployment Compensation, Office of Workers' Compensation, or the Office of Occupational Safety and Health. More info can be found here. The District of Columbia Office Of Human Rights requires that all employers post these three mandatory labor law posters in a prominant area within the workplace. Most District of Columbia businesses will also need to post the Federal Department of Labor's mandatory posters in addition to these state posters. General Labor Law Poster DC Family Medical Leave Act Provides information on the DC Family and Medical leave act. General Labor Law Poster Protecting Pregnant Workers Act The Protecting Pregnant Workers Fairness Act (PPW) requires District of Columbia employers to provide reasonable workplace accommodations for employees. There are an additional three District of Columbia labor law posters that are either optional, or mandatory only for a certain type of employer. Be sure to check this list carefully to see which posters are relevant to your business. General Labor Law Poster LGBTQ Diversity in Workplace Optional Posters with information about LGBTQ Diversity in the Workplace. Spanish Language Parental Leave Poster (Spanish) All Employers who employ Spanish speaking employees Poster containing information on Parental Leave for spanish-speaking employees. Spanish Language Pregnant Workers' Protection Poster (Spanish) All Employers who employ Spanish speaking employees The Protecting Pregnant Workers Fairness Act (PPW) requires District of Columbia employers to provide reasonable workplace accommodations for employees. Spanish Language Family and Medical Leave (Spanish) All Employers who employ Spanish speaking employees Provides information on the DC Family and Medical leave act. Printed all of your District of Columbia labor law posters? Be sure to check out the free federal labor law posters page to ensure that you comply with Department of Labor mandatory posting laws. Disclaimer: While we do our best to keep this list of District of Columbia labor law postings up to date and complete, we cannot be held liable for errors or omissions. Is a poster on this page missing or out-of-date? Please let us know so we can fix it!